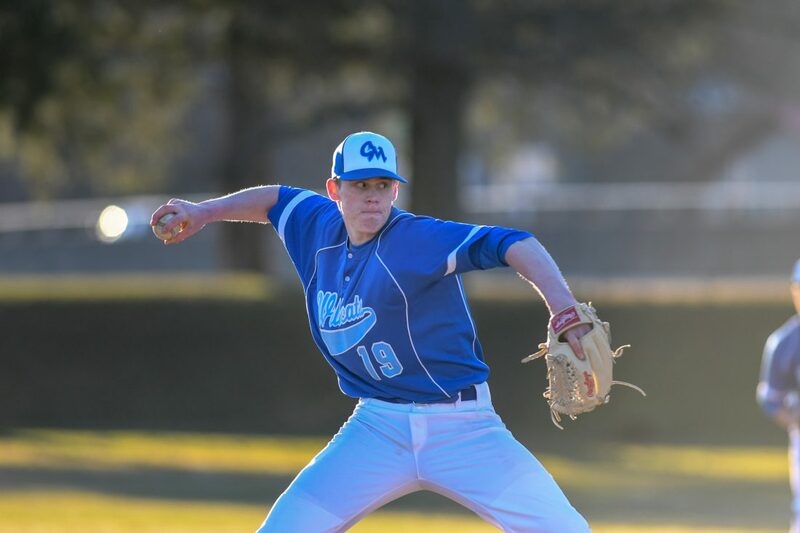 (TIM WEIGHT/FOR THE EXPRESS) Central Mountain’s Zane Probst throws a pitch last week in a high school baseball game versus Shikellamy. CM won the game, 12-10. MILL HALL- Spring sports are now in full swing, and despite a washout of events on Friday of last week, there was plenty of action in and around Wildcat land. 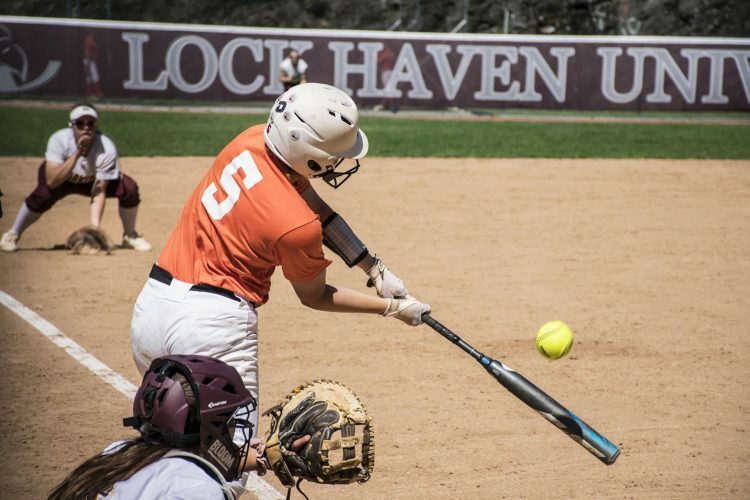 The Lady Wildcat soft ballers had a rough week, baseball split two games, track and field continued its team struggles despite witnessing some solid individual performances and the boy’s tennis team continued to battle. Let’s break down what we have. 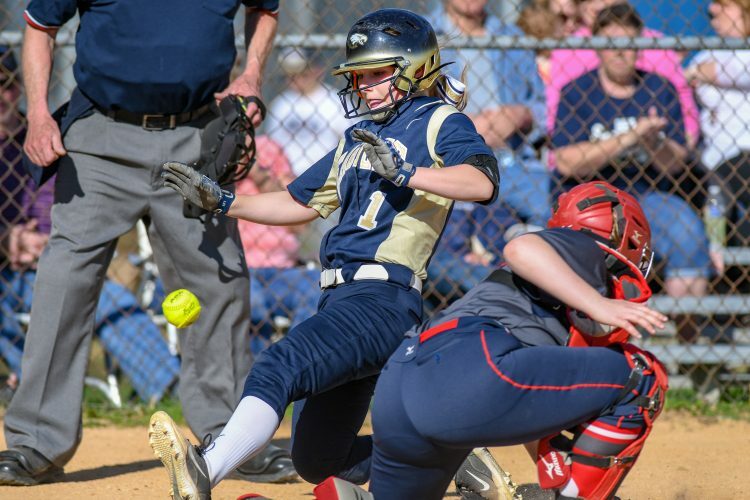 Coach Fred Caldwell led the Lady Wildcat softball team into action three times last week. Unfortunately, the theme for the week was a lack of hitting. 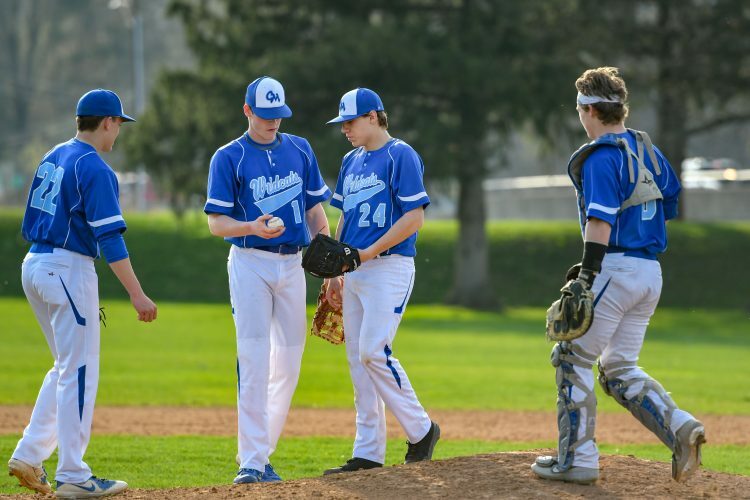 On Monday CM suffered a loss on the road at Mifflin County by a 9-4 score. Then on Tuesday they hosted a tough and experienced opponent in Mifflinburg. 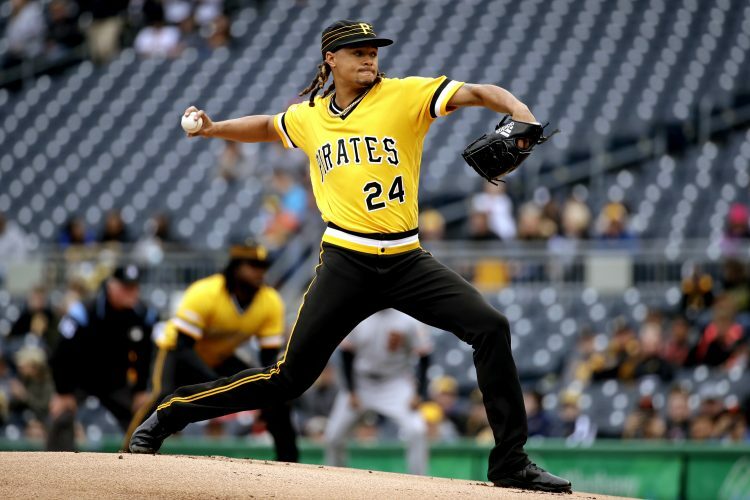 The locals failed to register a hit en route to a six-inning 10-run defeat. On Thursday the girls looked to rebound from the losses when they headed to Jersey Shore for a key early season matchup with the Lady Bulldogs. The home team jumped on their visitors early with a five spot in the bottom of the second and then held on as the Lady Wildcats fought back before suffering a close 5-4 loss. Finding hits was again a challenge as CM could muster just five in the contest. CM’s leading hitters were senior Morgan Wetzel who was 2-for-3 with a triple and two RBI’s and freshman Caitlin Watson with a single and double. The Lady Cats are now 2-4 on the young season. Mike Kramer saw his Wildcat Baseball squad split a pair of games last week against PHAC competition. On Monday they hosted Shikellamy and won in a shootout 12-10. Despite the offensive outburst by both teams, the highlight of the day for CM was perhaps the lockdown pitching performance of Junior Zane Probst who pitched the final three innings surrendering just a walk and a hit while striking out three. Wednesday’s game at Mill Hall Park took on a completely different feel as the Cats took on visiting Selinsgrove. Runs were tough to come by for both teams. The Seals would ultimately walk off the diamond with a hard fought 3-1 victory behind a complete game performance from their starting hurler. Aaron Swartz and Caleb Shade were solid on the mound for CM as well, but were ultimately outdueled on the windy early spring day. A Peak at the Future: When considering the performances of junior high and JV teams it is very important to not look solely at wins and losses. Rather, what is key is to consider the quality of individual performances. How likely are the players at that level to eventually make an impact at the varsity level? With that in mind there is strong reason to feel confident that both the softball and baseball programs have some young kids on the horizon that will make an impact at the varsity level fairly soon. Both the JV softball and baseball teams are currently undefeated but more importantly the quality of play by a number of young players provides reason for great optimism. On Wednesday afternoon I witnessed for myself some of the talent of the JV baseball team. Yes, they won. However, I was personally impressed by two things that I witnessed. First, sophomore first baseman Landyn Carson swings a bat that the ball jumps off of. Second, sophomore Blade Myers can flat out go get it in center field. He gets a tremendous jump of balls. There are a number of others to keep an eye on as well. This doesn’t take into account a number of freshmen and sophomores already making an impact for the varsity softball and baseball teams. Time will tell with those kids but the arrow for both programs continues to point in the direction of sustained success. I will keep an eye on those teams. The boy’s tennis team hosted a four-team tournament at the Gibson Courts at Central Mountain HS on Tuesday. The Wildcat boys went 1-1 on the day. They were dropped 4- 1 by Altoona in the opening round before defeating Mifflin County by a 5-0 score to capture third place. The No. 2 freshmen doubles combo of Ethan Hall and Leisher Gugino picked up two wins on the day. Both the boy’s and girl’s track and field teams are struggling as units. However, that does not mean that they are not putting up some solid-individual performances along the way. On Wednesday CM hosted Williamsport behind the middle school. Earning first place in individual events for the Wildcats and Lady Wildcat were Ashley Rich, Amelia McCloy and Ellie Nesbitt. Sarah Probst was a double winner taking first in both the Shot Put and Discuss events. 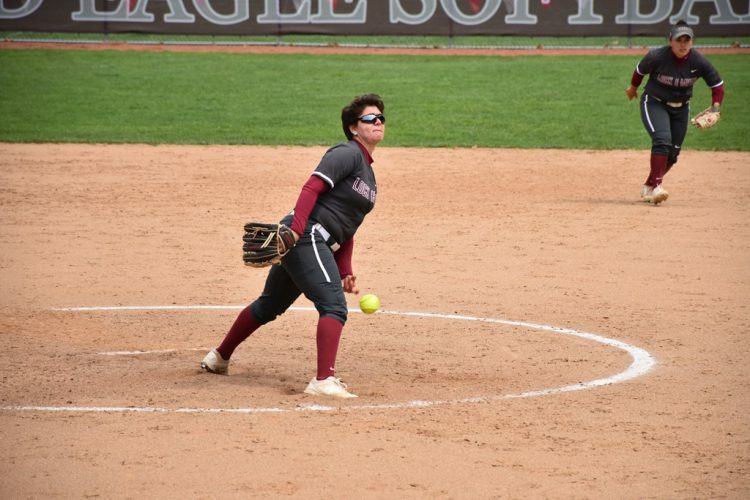 Athlete of the Week: My selection this week for top athlete goes to Sarah Probst on the strength of her double victory on Wednesday against Williamsport. Morgan Wetzel was also considered. Team of the Week: Shout-outs to the JV baseball and softball teams for their solid play in the early portion of the season. Looking Ahead: It’s going to be a huge week for the baseball team. Today they travel to Williamsport for a match-up with the Millionaires. On Wednesday they will make up their postponed game at Jersey Shore. Finally, they will conclude their big week by travelling to State College on Friday to take on the always tough Little Lions. The softball team will be in action today at Hollidaysburg, then hosting Shikellamy on Thursday and traveling to State College on Friday. The track and field teams will be on the road at Altoona on Tuesday before hosting Selinsgrove in Mill Hall on Thursday. Finally, the tennis team will compete four times this week. Wednesday’s matchup with Danville is a home event. There is also plenty of junior high and JV action scheduled for the week. Take advantage of what looks to be a fairly decent week of weather to get out and take in some competitive action.